Giant Hogweed (Heracleum mantegazzianum) is a non-native invasive plant species that can grow abundantly along a range of habitat types, notably the banks of rivers and streams and some road corridors. Taxonomically, it is a member of the family Apiaceae (carrots/umbellifers), and is native to the Caucasus and Central Asia. 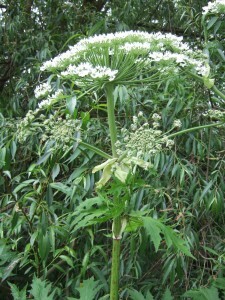 Giant Hogweed is biennial to perennial with tuberous rootstalks which form perennating buds each year. It can take four years before a plant produces a flower stalk, with flower heads appearing from late spring to mid-summer. Flower heads comprise clusters of thousands of small individual white flowers forming large, umbrella-shaped, heads up to 80cm in diameter across their flat tops. 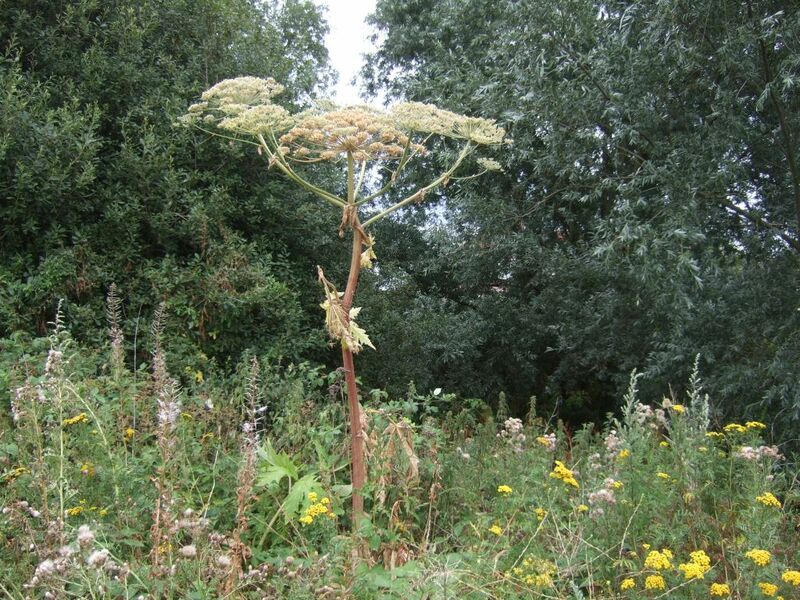 Giant hogweed is a human health hazard and exerts a negative ecological impact on locations where it thrives, which are mainly along the banks of rivers and other watercourses. The plants contain substances called furanocoumarins within their sap, which, on contact with skin causes it to become sensitive to sunlight. This can result in severe burns to affected areas, producing painful swelling and blistering. The invasive nature of giant hogweed plants often results in them growing at the expense of many native species, reducing suitable habitat for other plants and hence the food and shelter for the insects, birds and mammals that rely on them. 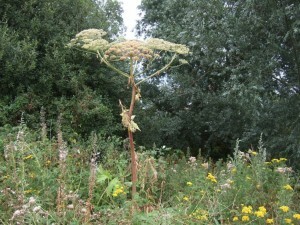 Each giant hogweed plant can produce up to 50,000 seeds per flower head, which appear in late summer. These seeds can remain dormant in the soil for several years – anecdotally as much as ten years. The movement of soil containing giant hogweed seeds must be carefully controlled to prevent the spread of the plant. UK environmental agencies consider soil containing seeds to be controlled waste and must be handled and disposed of in accordance with the appropriate legal duty of care. 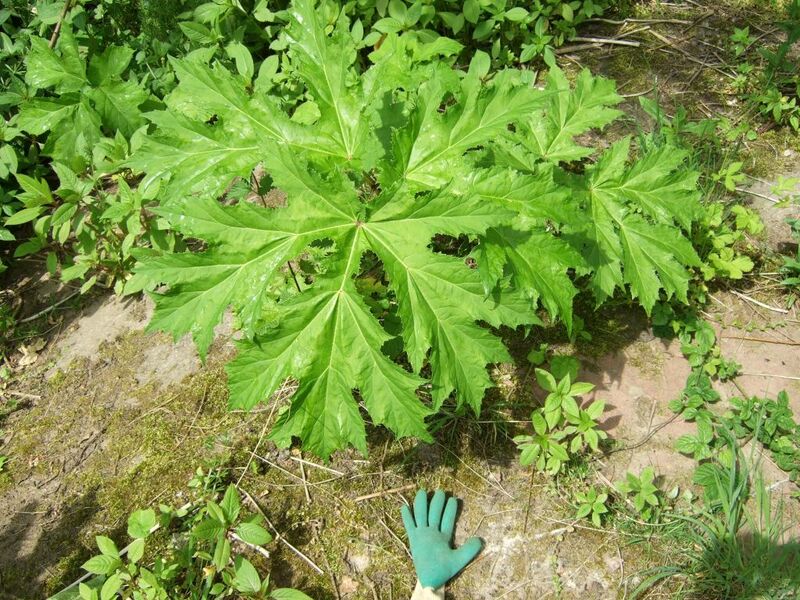 It is a criminal offence to plant or to cause giant hogweed to spread in the wild. It is characterized by its enormous size and may grow to 5m tall. It is further distinguished by a stout, bristled, hollow, blotched dark reddish-purple stem and spotted leaf stalks. Stems vary from 3-8 cm in diameter, occasionally up to 10 cm. Plants have deeply incised compound leaves which grow up to 1-1.7m wide. Seeds (actually fruits) are flattened, 1cm long, oval, ridged, dry pods. Leaves at the base of the plants die back in the autumn. It takes around four years for plants to develop flower stems, after which, following seed set, the plant dies. 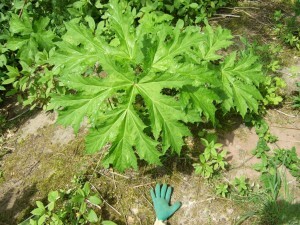 Spraying with an appropriate herbicide such as glyphosate can be particularly effective in controlling giant hogweed. However, this does not treat the underlying seed bank, which can remain viable for several years (perhaps as much as ten years). Therefore repeat applications of herbicide will usually be required over this time until the seedbank is depleted. It is vitally important that herbicides are applied in early summer, before the plants produce seeds, otherwise the seedbank will be refreshed. A particularly effective treatment strategy that avoids using herbicides and relies on the fact that plants die after setting seed is also available. Simply cutting off the flower heads before they seed will result in the plants dying before they can reproduce. If this is done successively until the seedbank is depleted, it will result in eradication. However, it can be labour intensive and requires long term commitment to the goal in hand. Such methods are employed by numerous authorities along many river catchments, where effective control is necessary to prevent the rapid spread of seeds downstream. Quite often, such treatment strategies rely on the long term use of volunteer groups. However, the health and safety risks of working amongst giant hogweed and being exposed to the plant’s sap need to be effectively assessed and mitigated (e.g. use of appropriate coveralls, gloves and eye protection). A more immediate solution with far greater impact that is often utilised on development sites is to clear the aboveground leaves and stem material and to scrape up the soil containing the seeds. Seeds will usually only be present in the top 5cm or so of soil and as they are relatively large and heavy, they don’t tend to spread too far (e.g. maybe a few metres), unless in flowing water. However, it’s almost impossible to guarantee that all seeds have been removed. Therefore, continued monitoring and herbicide application to new plants is recommended for several years following the initial treatment. We can help solve your giant hogweed problem. We can be contracted directly to carry out the site works outlined above, or employed in a consultancy role to map areas of invasion and provide detailed management plans to eradicate the problem.